I've mentioned before how spotty my U.S. history is and how I don't remember anything I "learned" from the dry textbooks I was given in school growing up. It was just a recitation of facts and I don't think any of them actually stuck with me - I just remember trying to memorize key names, dates, and phrases to pass tests. Well, I was finally inspired to get a fuller picture of the beginnings of our nation with this book by Nathanial Philbrick. He's popular so I thought it might be readable enough for me. It begins with the first pilgrims leaving England, going to the Netherlands (we weren't taught about that part in school,) and then traveling aboard the Mayflower to the new world. They found a spot where nobody was living, made friends with the native people nearby and tried to integrate in a peaceful way, and then 50 years later the Puritans really screwed things up and then came King Phillip's War, which changed the whole dynamic until it became English vs. Indians, and you know who lost that war. I really liked the nuance here, which is lost from pretty much all discussions about this time period I've ever been a part of. As a kid it was all happy pilgrims coming to a new land and everything was fine! Then as an adult everyone was like "Everything you learned was wrong! All the Europeans just came and murdered everyone in cold blood!" Of course the truth is somewhere in between. Those first to arrive acknowledged that there were others here first and that they had rights. They reached out to the indigenous people and befriended them and learned from them. They had to depend on them to survive and they appreciated that, but their descendants and the Puritans who came later hadn't had those same experiences and they just wanted the Indians out of there so they could have all the land. I think this book was the first time I knew the difference between Pilgrims and Puritans, and it was definitely the first time I got such a complete story about the first white settlers in New England. However it was still a nonfiction book about history, so I got bogged down in certain parts. When the war really started up and there was a lot of descriptions about military maneuvers and transactions and other things that are more difficult to picture I struggled a bit. Plus there were a lot of names and tribes, and it was hard to keep straight who was who. Another thing I never learned as a kid was that the different tribes had different alliances, so initially the war wasn't just between the English and the Indians, but some of the English made it into a racial thing rather than about the original issues, which was pretty interesting. But I know my difficulty understanding some of that is just the way I read and understand what I'm reading. In fiction they say you need to show rather than tell, and in nonfiction there is just naturally more telling. Sometimes they don't have enough detail to flesh it out the way fiction does, and sometimes an event just needs to be summed up so as not to take up an extra 100 pages. It just makes it hard for me to visualize what's happening or integrate it into the story I'm reading. This isn't a criticism of the book at all, just an acknowledgement of my own shortcomings in being able to take in nonfiction, particularly about history. All in all, I'm very glad I read this book. I learned a lot from it and I'm sure I'll forget most of it very soon as I am wont to do, but that's probably just more reason to make a habit of reading nonfiction. 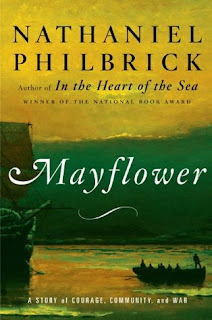 This is sort of timely as next year marks the 400th anniversary of the arrival of the Mayflower, but of course any time is a good time to learn more about history.